Ferrero Rocher chocolates are probably amongst the most popular and versatile gifts that you can give or receive at Christmas. Romantic boyfriends present it to their sweethearts in the form of a Ferrero Rocher bouquet. Friends give it to one another to show that they care. Now, here’s something that is quite different. Have you ever seen a Christmas tree made out of Ferrero Rochers? 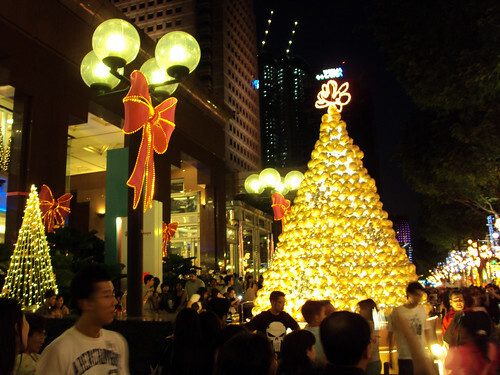 This golden chocolate tree can be admired (but not eaten) just outside Ngee Ann City. It’s certainly a show-stopper! Amongst the golden balls are small disco balls, arranged in the shape of snowflakes. What a great product placement! It comes at just the right time of the year, too! German brand Braun Büffel did it one Christmas. So did Mercedes-Benz the year before that. Update: The Ferrero Rocher chocolate tree is back in Christmas 2010. You can find it at The Heeren. OMG is that really a xmas tree?? It’s too cute and scrumptious!!! Look at all the Rochers big and small piling up. You know it’s only a matter of time before they get plucked out and go missing one by one. I wonder the same thing myself. People do seem to have that tendency, don’t they? Remember when the hundreds of charity plastic flowers went missing overnight at Raffles Place? And the Moo cow advertising placards by the side of the road that got “adopted” one by one? Those things look huge and heavy and that doesn’t stop people from taking them. I’m only surprised that by the time I got to the Ferrero Rocher tree, all the Rochers still appear intact. Looking closer it appears that one of the disco balls at the bottom is already gone! lol! !